How can something that's 3,000 years old taste so good? Those Aztecs and Mayans really knew how to put the cacao beans to good use. After all, they're a bitter bunch. The beans, I mean. The pods had to be harvested carefully, fermented to bring out its full flavour, then dried and pulverized before it could be mixed with water to create that luscious drink we all know as xocolatl or chocolate. 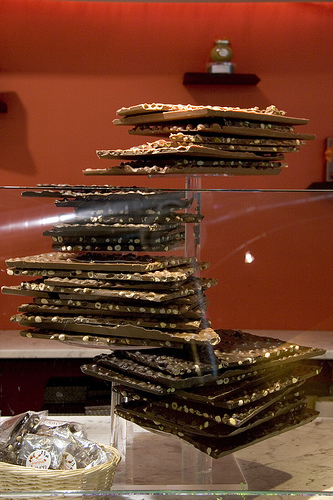 When Hernan Cortez, a Spaniard, conquered Mexico in 1521, he brought chocolate into the world stage in Europe. Demand grew and creative Europeans started experimenting on techniques to improve on the bitter drink. Sugar, milk, and even honey were added to sweeten the thick beverage. However, it wasn't until the advent of the Industrial Revolution in the 1700's that chocolate became a solid confection. Today, chocolate's popularity - as beverage or candy - is worldwide. And according to Brillat-Savarin, "What is health? It is chocolate." Here's a round-up of chocolate purveyors from two of the world's top gastronomic cities. 30 Rue Des Saints-Pères, 7th arr. 33 Rue Vivienne, 2nd arr. 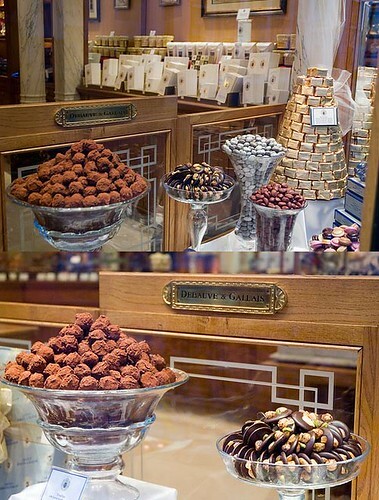 Opening its first chocolate shop at the Left Bank in 1800, Debauve & Gallais is reputed to be the oldest chocolatier in Paris. Piedmont hazelnuts, Perigord walnuts, Spanish almonds, Turin chestnuts, Turkish raisins, and Antilles rum - the best ingredients the market can source - are used to produce the perfect chocolate alchemy possible. My personal favourites include the Montelimar, nougat in 60% dark chocolate; Colombien, 72% dark chocolate infused with Colombian coffee; Craquenoir, praline with crushed wafers in 60% dark chocolate with drizzled milk chocolate; and the emblematic Palet Debauve & Gallais, special reserve Ecuadorian cocoa ganache in 72% dark chocolate. The Rucher with lavender honey ganache and the specialité Rocher with crunchy almond, praline, and hazelnut are darlings of regular clients. 226 Rue de Rivoli, 1st arr. Although Angélina has fallen within the corporate restaurant group of Bertrand, its historic Belle Epoque maison has been rigourously preserved, making it undeniably one of Paris' most charming places to have a drink. Marcel Proust and Coco Chanel had been regular patrons, perhaps imbibing in their most popular beverage, L e Chocolat Africain. On the other hand, they could be cracking into the alabaster meringue of the Mont Blanc. But of course, there is also an extensive petit déjeuner and lunch menu. From praline barks to chocolate-covered fortune cookies and bon-bons, Monsieur Torres knows how to create delicious desserts that are free of additives and preservatives. In the Hudson Street location, visitors are treated to a firsthand view of the vintage machine churning cocoa beans into chocolate bars. Popular flavours include: Bandol Breeze, an apricot pâte de fruit with almond marzipan; Almondine, with almonds and ganache in dark chocolate couverture; Hearts of Passion, a heart-shaped milk chocolate morsel with a passion fruit middle. There are also the usual suspects of fillings namely, Grand Marnier, Earl Grey, Fresh Squeezed Lemon, and Butter Caramel housed in funky little tidbits. Founded by Maribel Lieberman, a-fashion-industry-runaway-turned-chocolatier, MarieBelle crafts fashionable chocolate works-of-art. Using cocoa butter and food colouring, Maribel silkscreens images on to her bon-bons with ultimate precision. Most of her lovely treats are made with 70% dark chocolate and infused with eclectic spices and fruit flavours. Being of Latin background, the stylish owner is obviously proud of that Mesoamerican heritage, the chocolate drink. In fact, at the Cacao Bar and Tea Salon, the rich Aztec Hot Chocolate, at 60% cacao, is their most popular potion. Other libations that make my list are: Spicy Hot Chocolate with Chipotle, Ancho Chile, nutmeg, and cinnamon; Mayan Hot Chocolate, unsweetened with 70% cacao. Also on brew are guava, jasmine, lychee, and chocolate rose teas, to name a few.